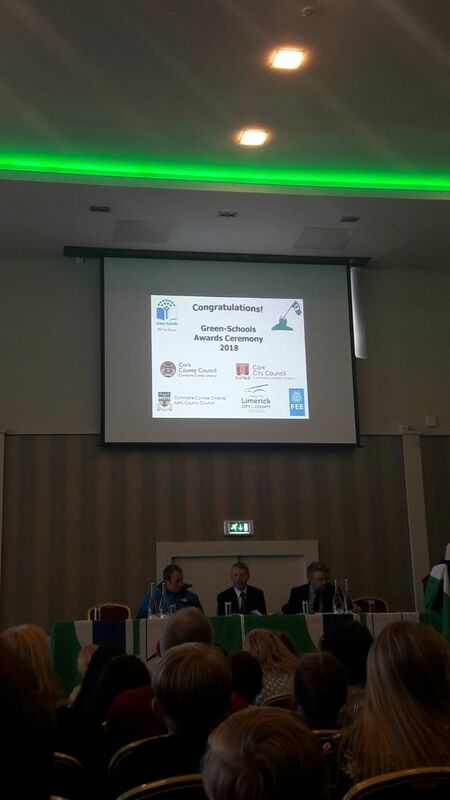 On Wednesday, May 2nd, 2018, members of the Green-School Committee from Scoil Naomh Micheál, Upper Glanmire attended the awards ceremony to receive the Green Flag for Travel. 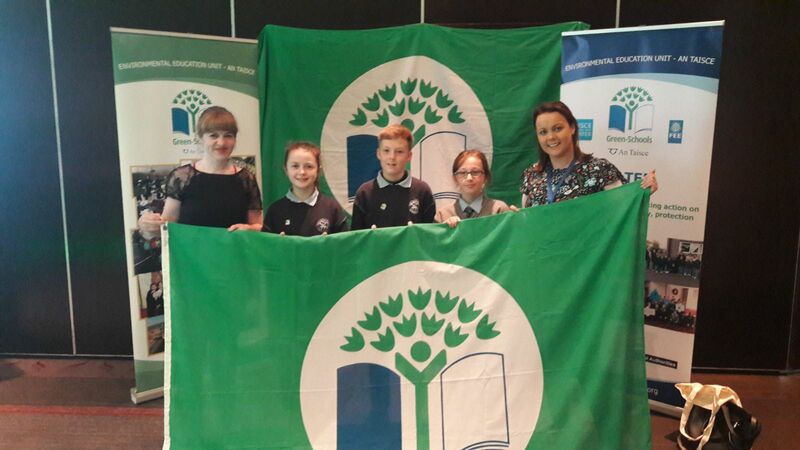 Chloe Gaffney from 6th class, Mark O’Keeffe from 5th class and Ellen Cooney from 3rd class traveled along with Ms. O’Halloran to attend the ceremony and were presented with our new flag. As you know we have been working hard towards this award over the past two years. 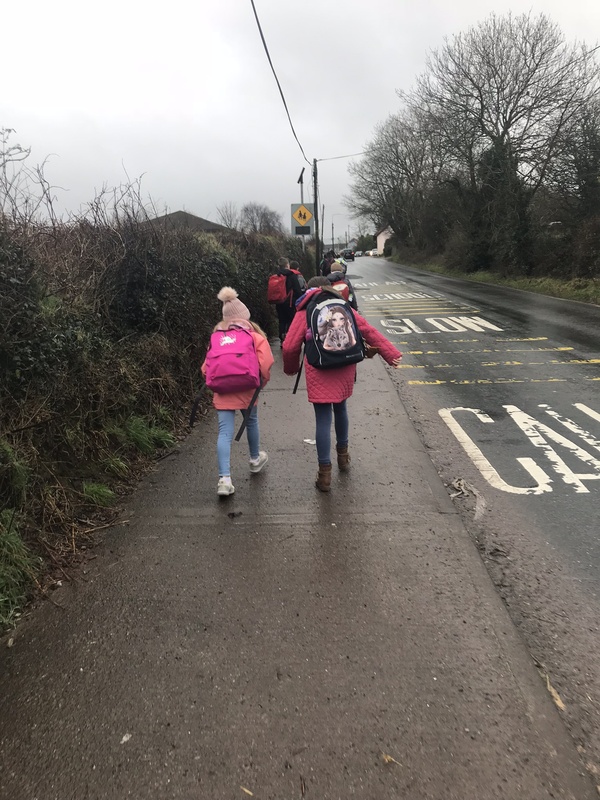 During that time infrastructure around the school has improved, making it safer and more pleasant for children and parents to walk to and from our school. 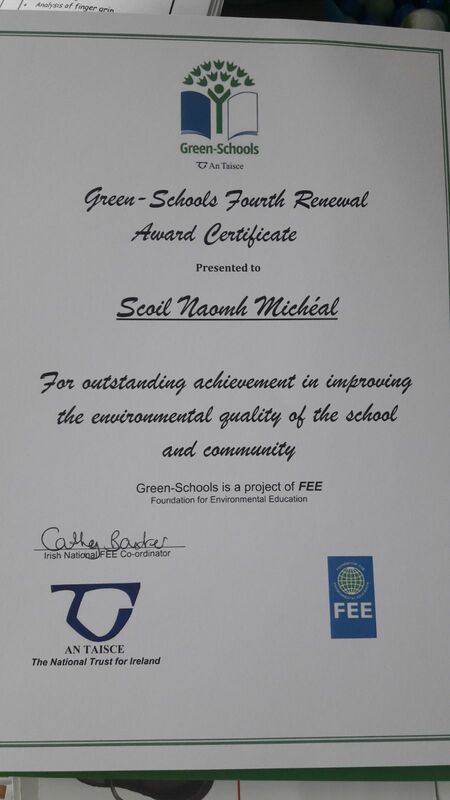 This is good for our school community and for the environment. 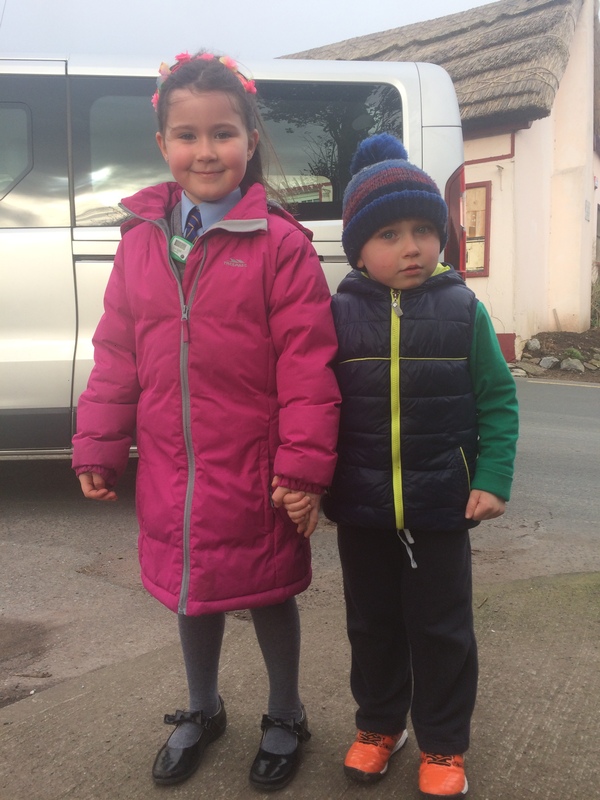 More children are walking to and from our school than ever before. We look forward to celebrating this award and raising our flag in June. 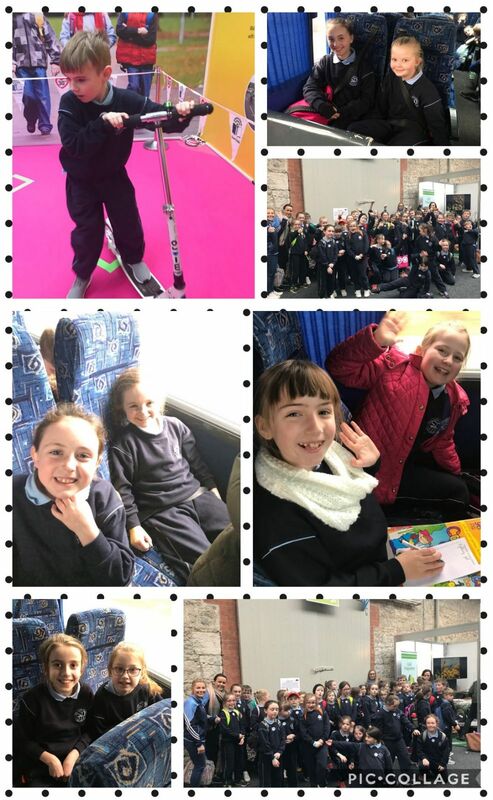 On Thursday, 22nd February all of our 3rd class children along with Ms. O’Shea, Ms. Flanagan, Carmel, Ms. O’Halloran and Ms. Walsh boarded the bus to Dublin for the Green-Schools Expo, 2018. 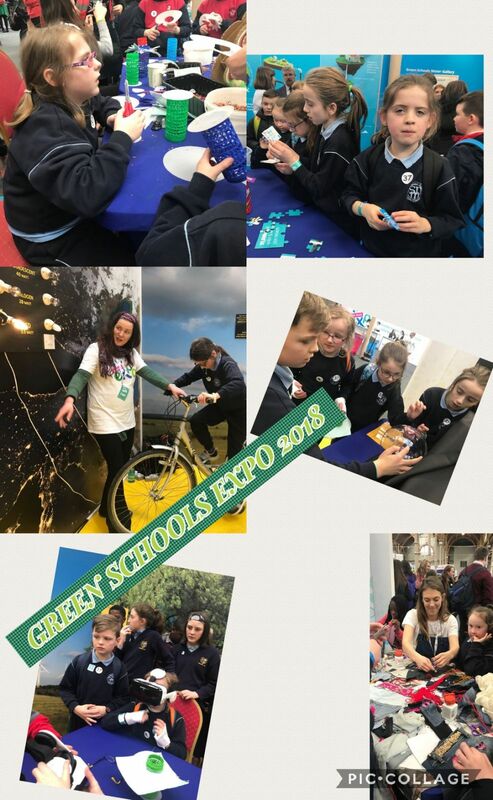 It was the first time our school had been represented at the Expo and we were delighted to have the opportunity to attend. 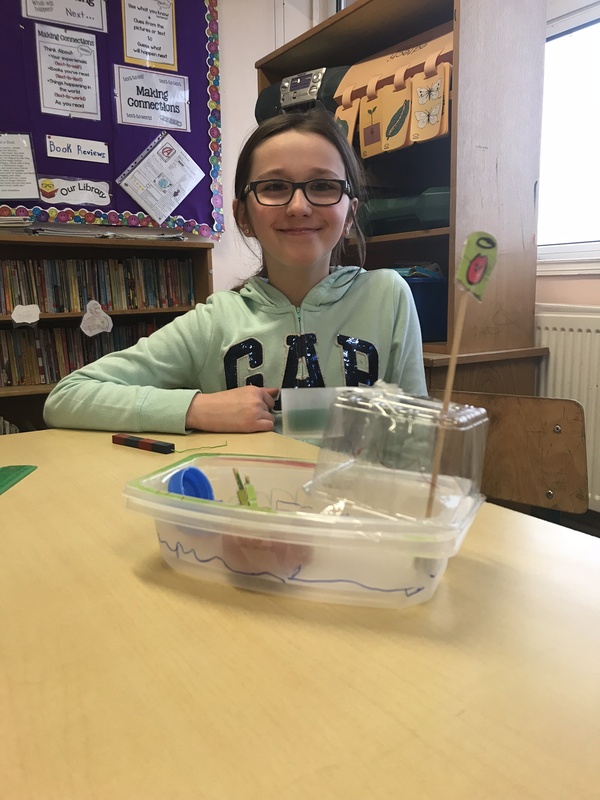 It was a jam packed event focused on Climate Change and what we can do in our school, homes and community to make a difference. 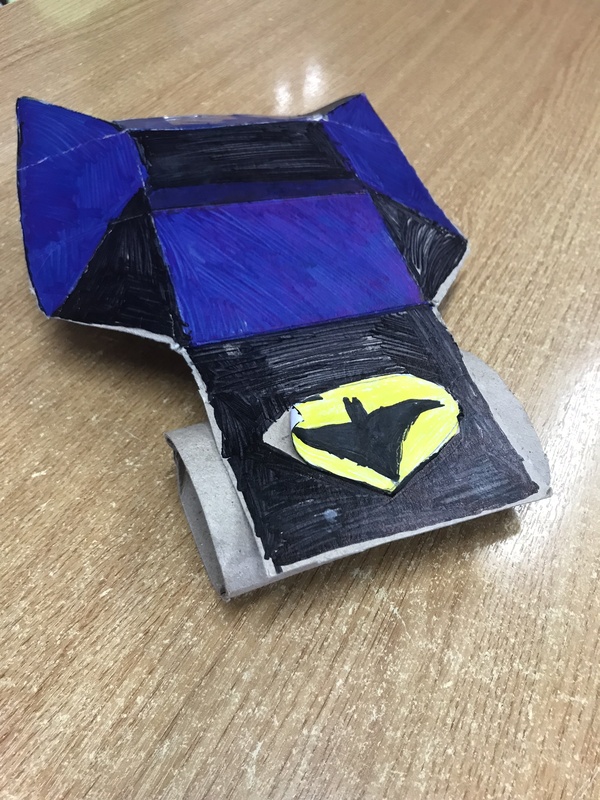 We saw exhibits from different schools, visited zones which highlighted the six green flag themes and used recycled materials to make useful objects such as bird feeders and aprons. 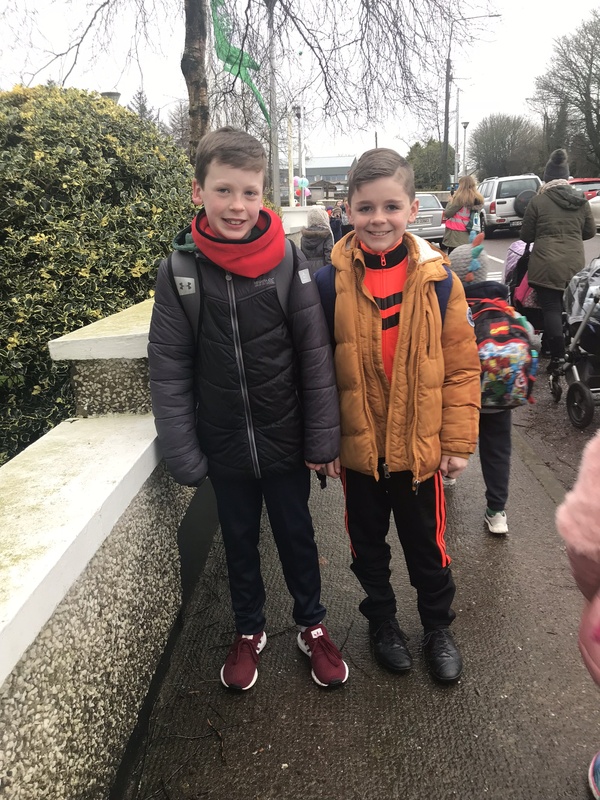 We also saw some of the sights of Dublin thanks to our bus driver Joe who took us past Trinity College, The Aviva Stadium and the Dáil. 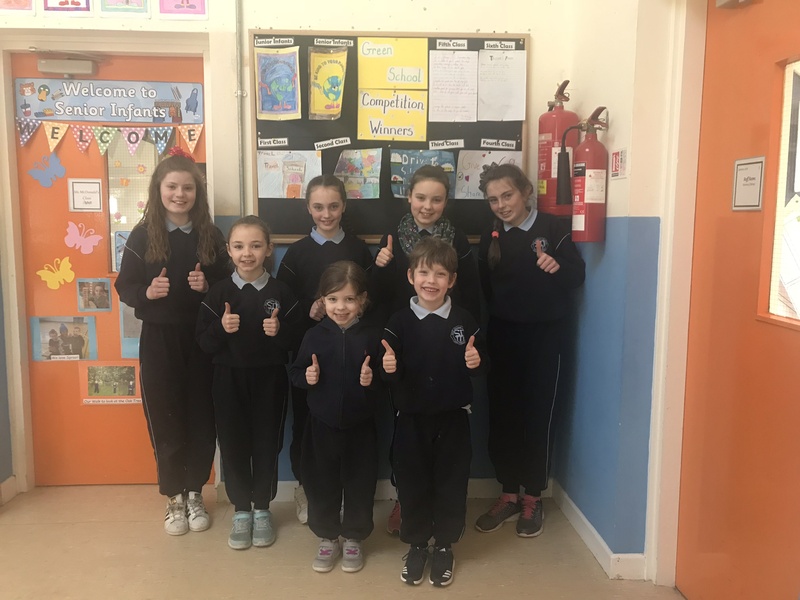 Well done to all of our competition winners who coloured pictures, designed posters, created slogans and composed poems and raps to help us to promote our Action Day. The winners are pictured below. 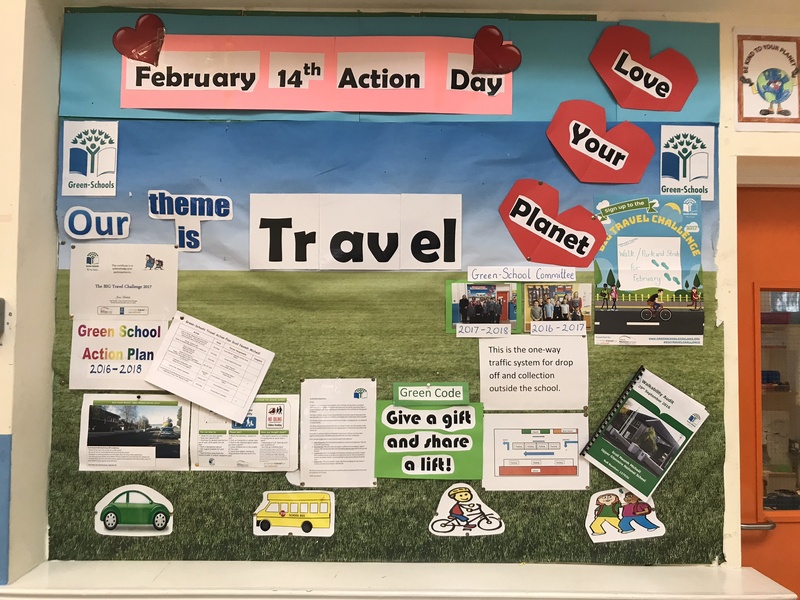 Our Green-School Action Day for the Travel theme took place last Friday, February 14th. Our theme for the day was “Love Your Planet” and all of the school community made a big effort to get involved on the day. 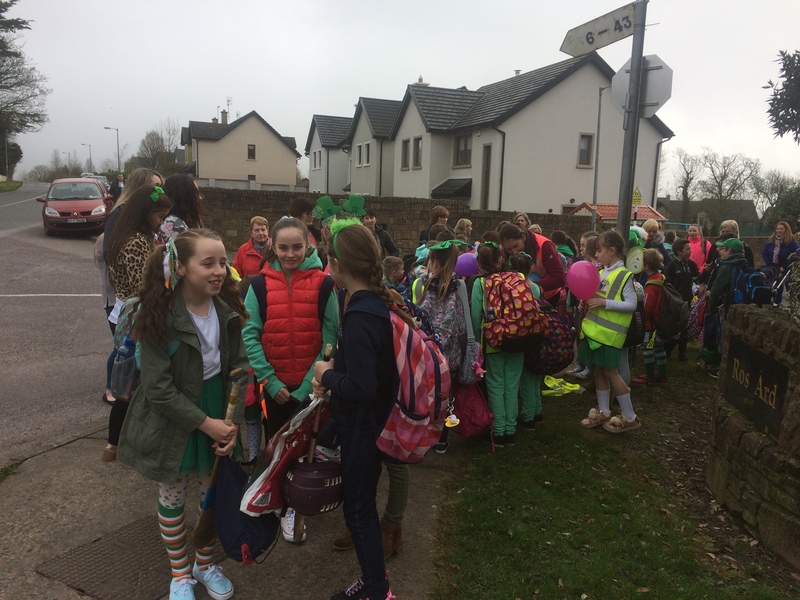 Children were invited to wear green, red or pink which added a celebratory atmosphere to the day. 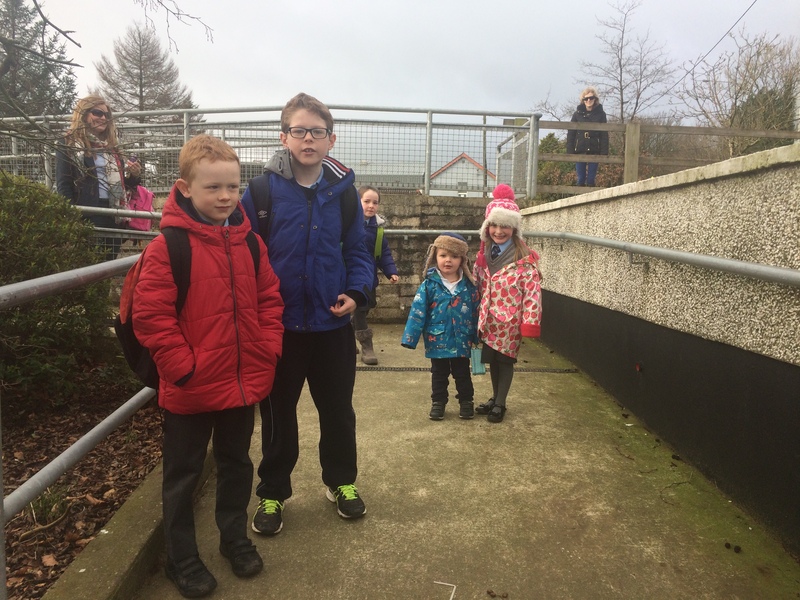 Staff, children, parents and other family members met at Ros Ard and we embarked on a WOW (walk on Wednesday) together. 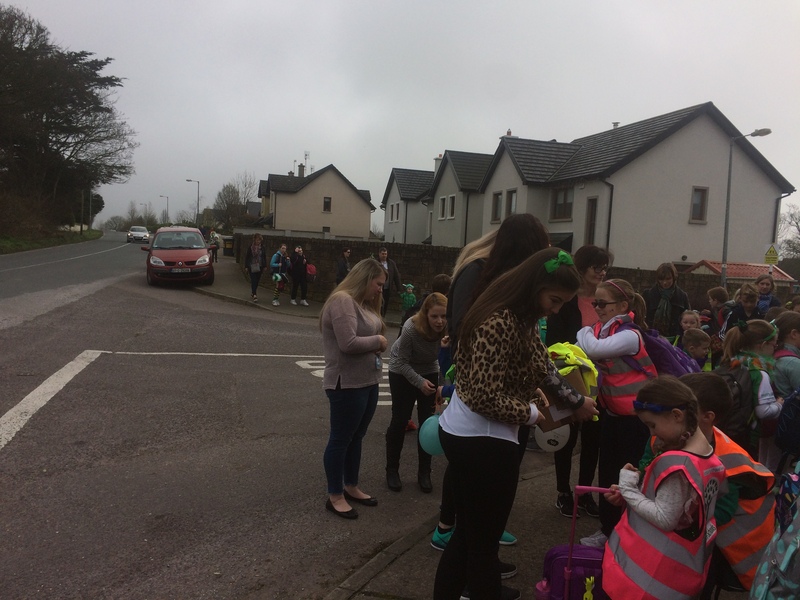 Our Travel Officer, Lisa O’Grady, joined us and she was very pleased at the impressive turn out. 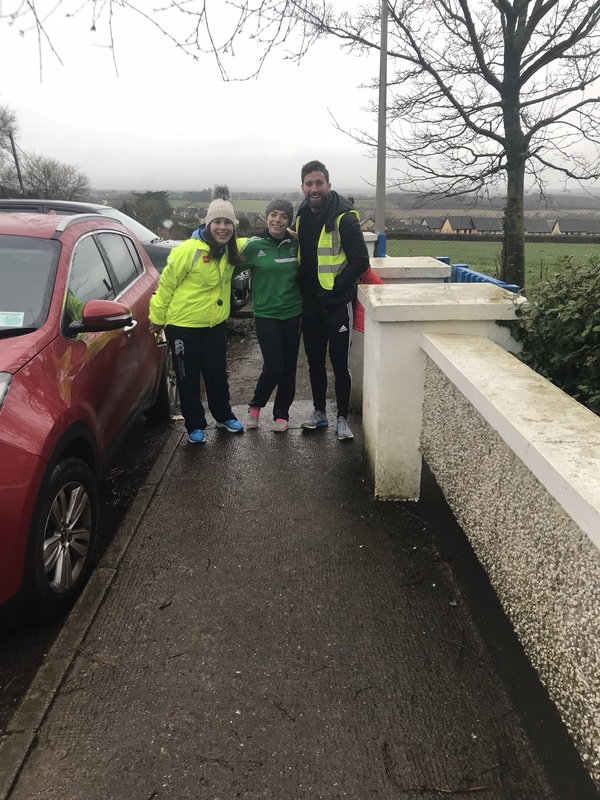 One of our parents and committee members, Katherine O’Shea brought some boxes of apples and bananas donated by Jump juice bar which the walkers enjoyed on their arrival. Thank you Katherine! Mr. O’Connell had some music playing which added to the positive atmosphere. 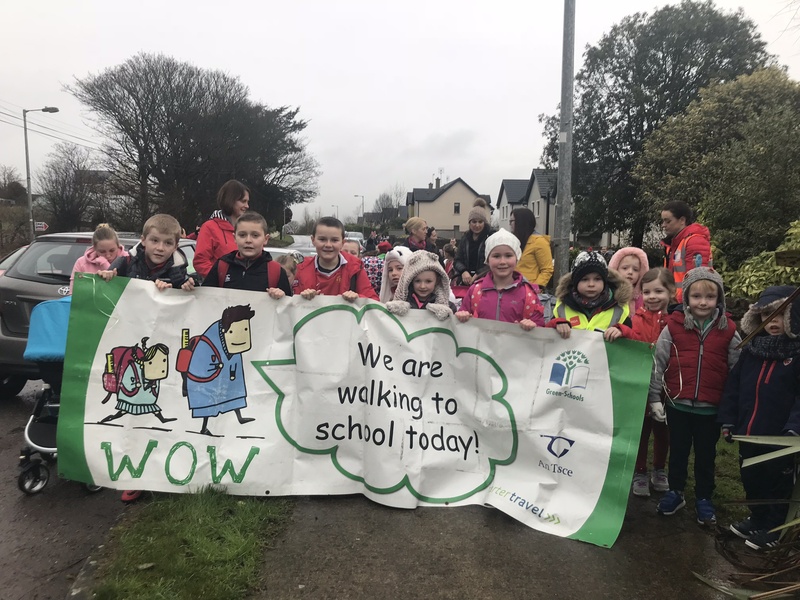 Many others who could not participate in the walk traveled to school in other environmentally friendly ways for example by school bus or car-pooling. 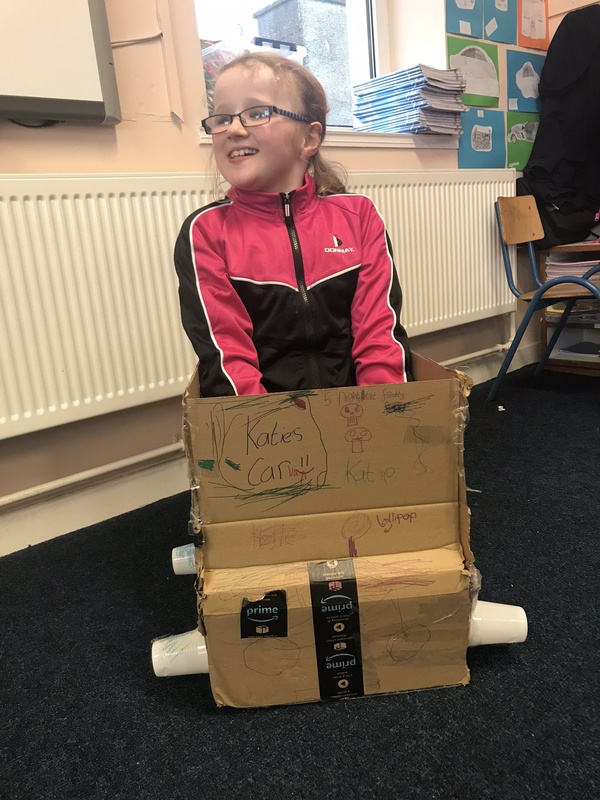 Lots of different activities went on in the different classes as the day progressed. 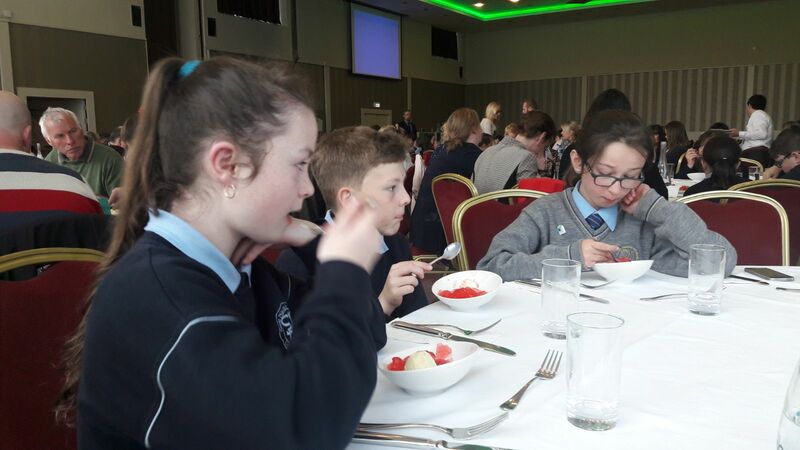 Cathal McCarthy from the Road Safety Authority completed his talks. 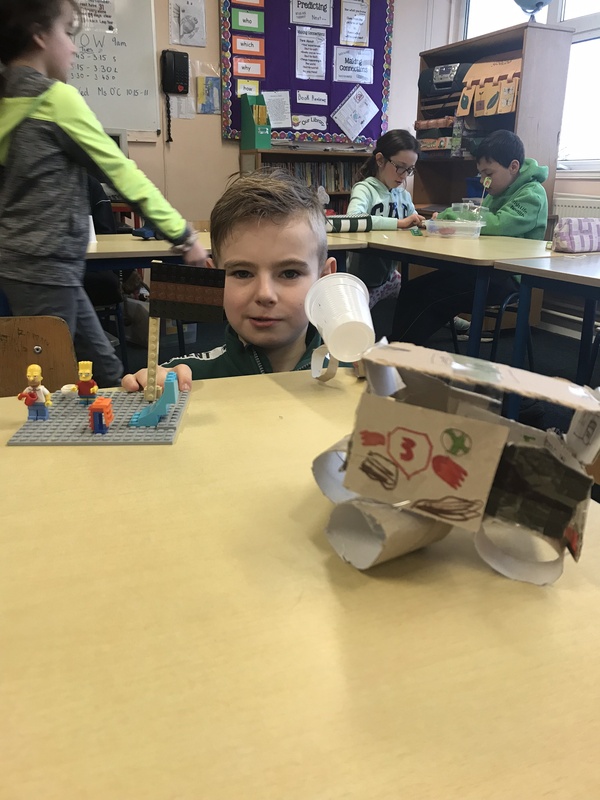 Over three days each of the classes had been visited by him for a presentation. 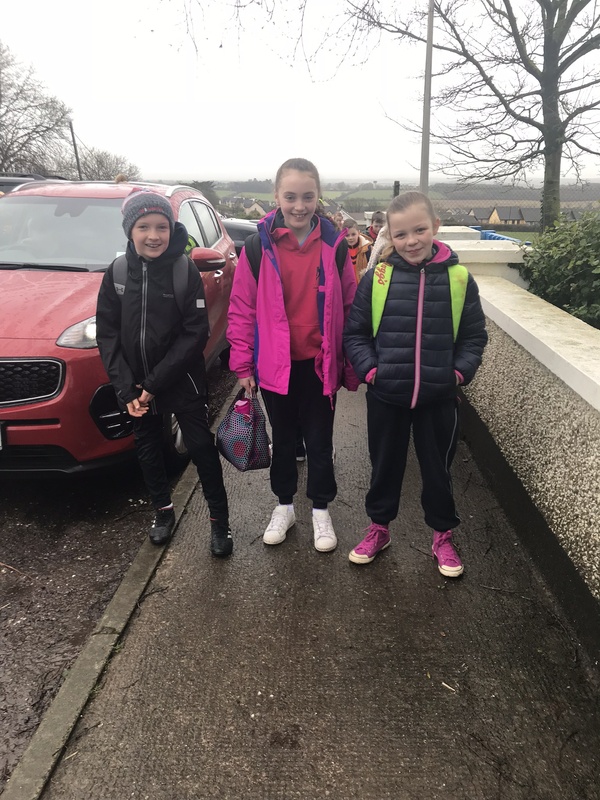 The feedback was very positive and the children learned a lot about road safety. 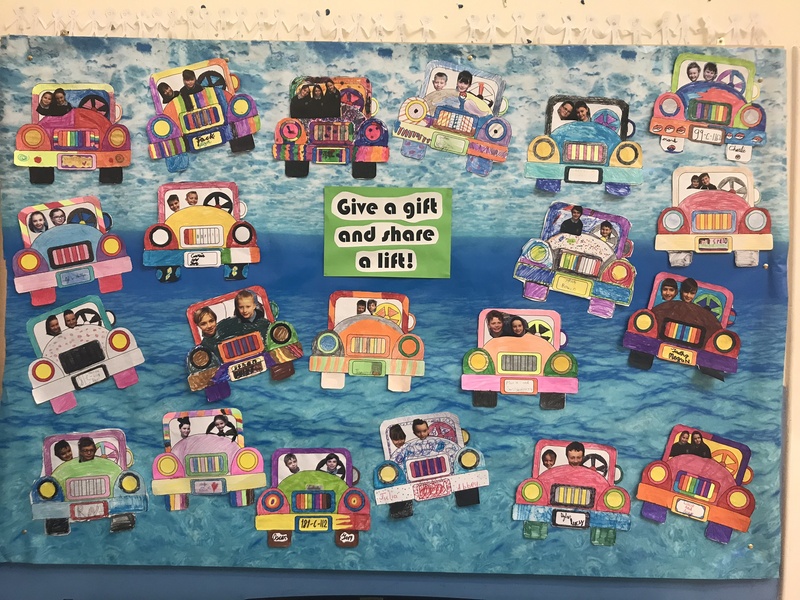 In Third Class the children made constructions of vehicles during their Art class and our Third/ Fourth class worked with their partners in First/ Second class to create a wonderful car-pool display. 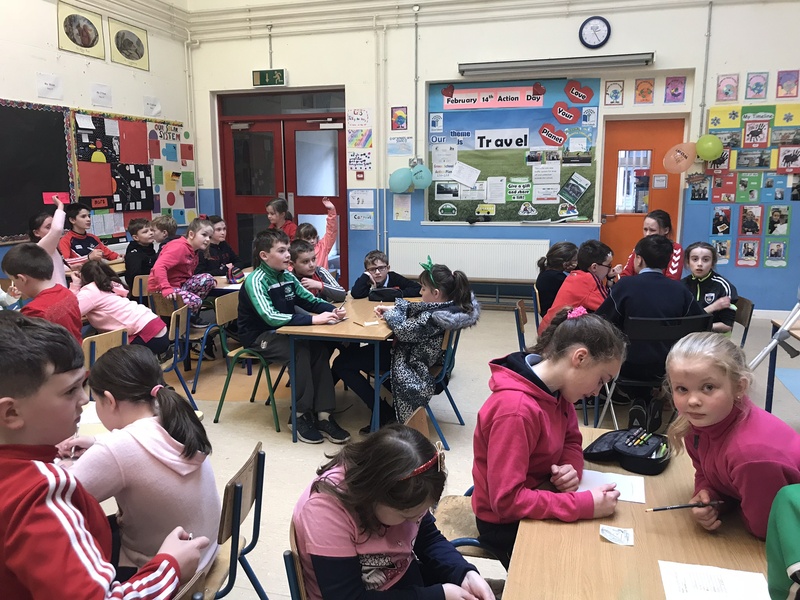 In the afternoon Third-Sixth classes took part in a table quiz which included a tricky Travel round. Well done to the winners. It was a great day and gave us all a chance to reflect on and celebrate the good work that has taken place in the school over the past two years as we work towards our fifth Green Flag. Take a look at your Green Team for 2017-2018. 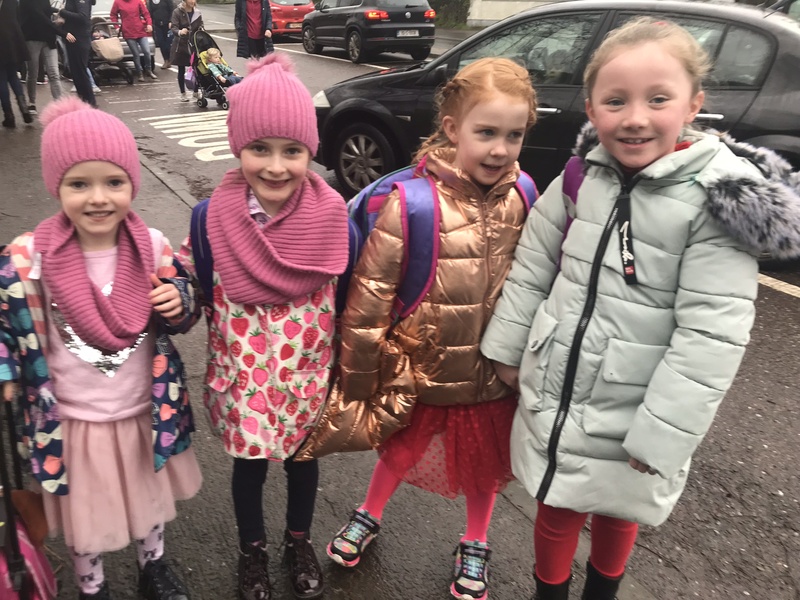 We would especially like to thank our parent committee members, Katherine O’Shea, parent of Faye in Senior Infants and Ros Ard Resident’s Association member and Kate Browne, parent of Annie May in First Class and representative of the Parent’s Association. 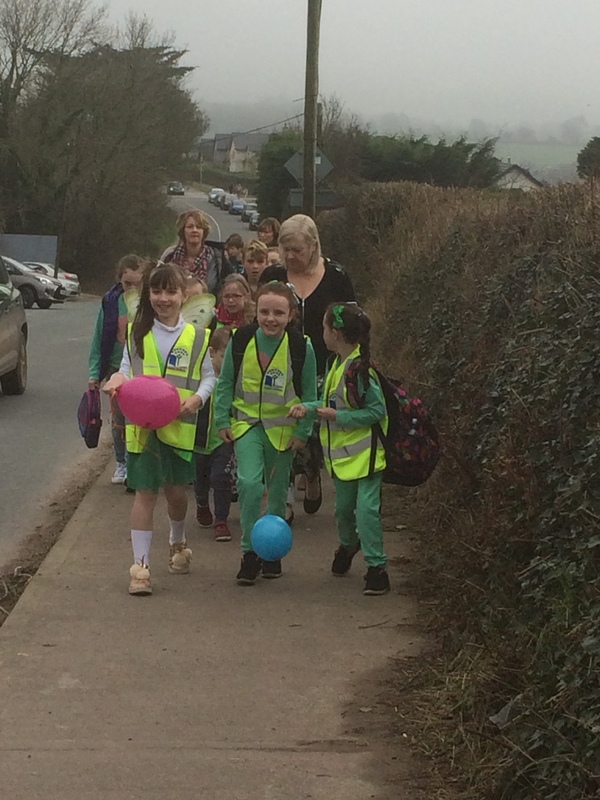 As we work towards our Green Flag for Travel, we continue to promote walking to school and car pooling to reduce the numbers of cars outside the school before and after school. 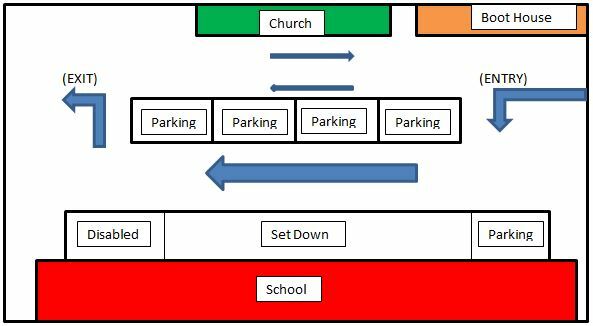 The parking area outside the school has been re-lined and we are encouraged to share the diagram below with the school community. The centre lane is for the continuous flow of traffic and cars should never stop here to collect children or allow children to exit. You will notice that there are designated parking spaces on both sides with a designated set down area on the left. We ask that as soon as you have dropped or collected children that you free up this set down area. 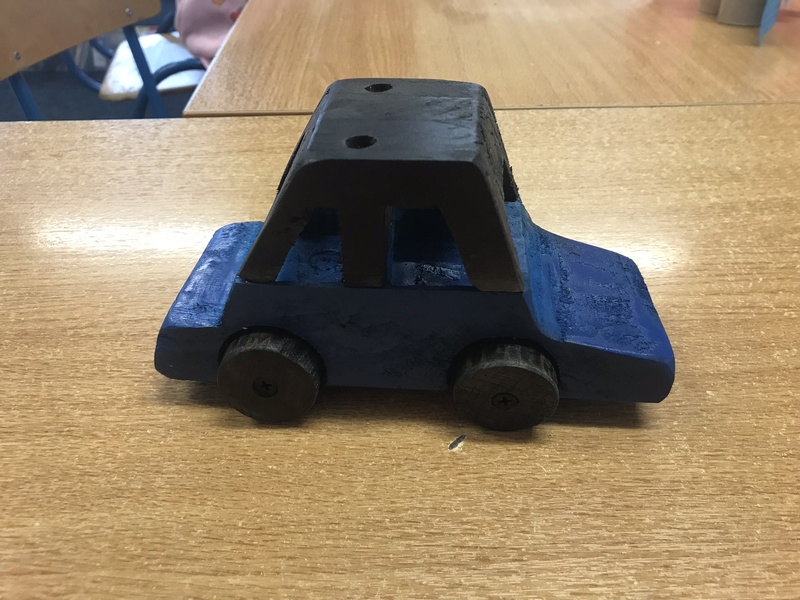 As always, safety is our priority and we always ask that you park your car and collect children from inside the school gate. Children will be supervised inside the school gates but we cannot accept responsibility for children outside the school gates. We thank you for your continued support. 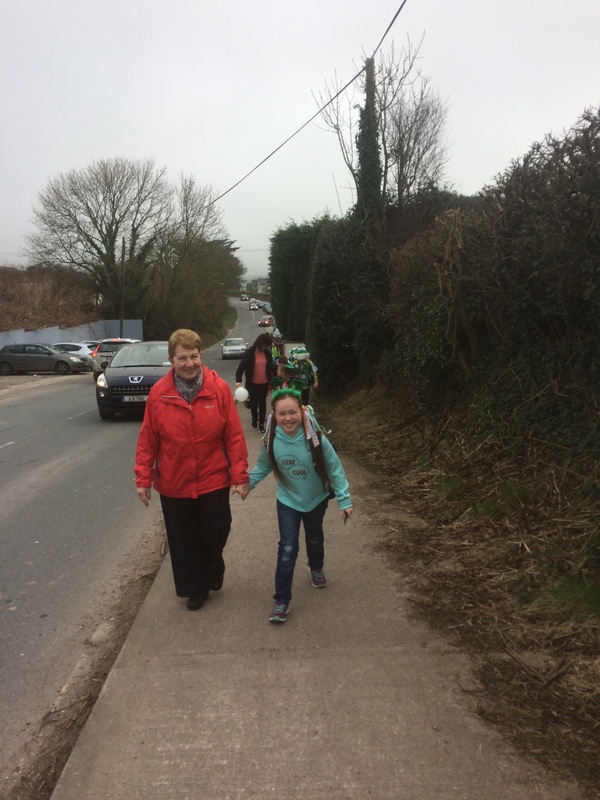 On Wednesday, 15th March, we launched our Walk on Wednesday campaign. 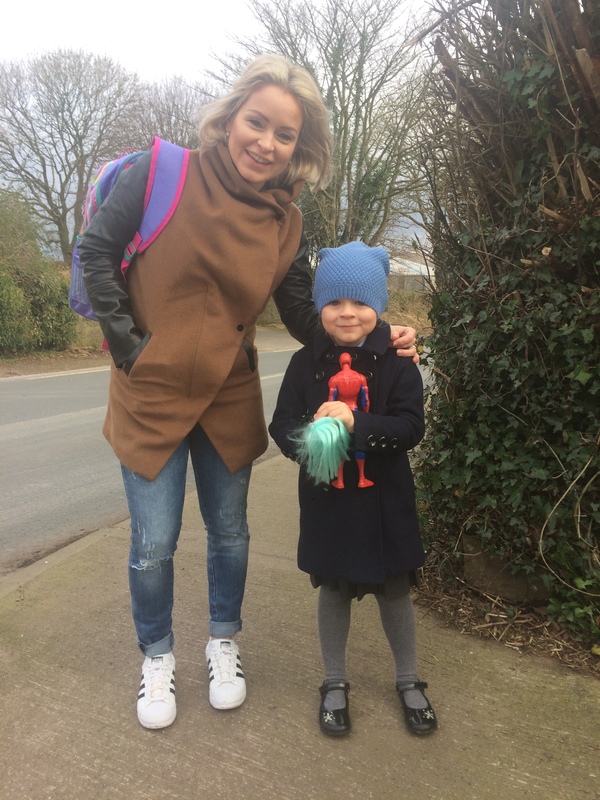 This initiative aims to encourage families to travel to school in a more sustainable way. 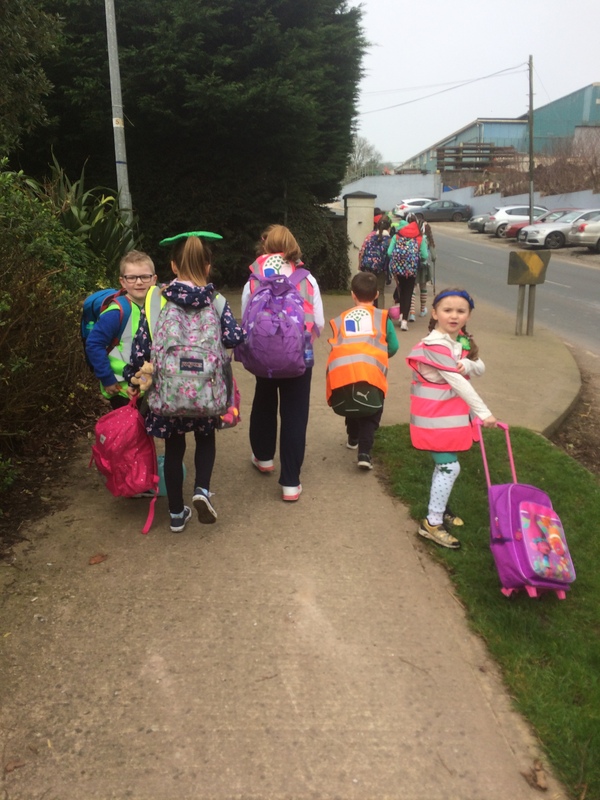 Because of our school’s location we decided to focus on walking, car pooling, park and striding and taking the bus. We planned to meet at Ros Ard at 9am to walk to school together. 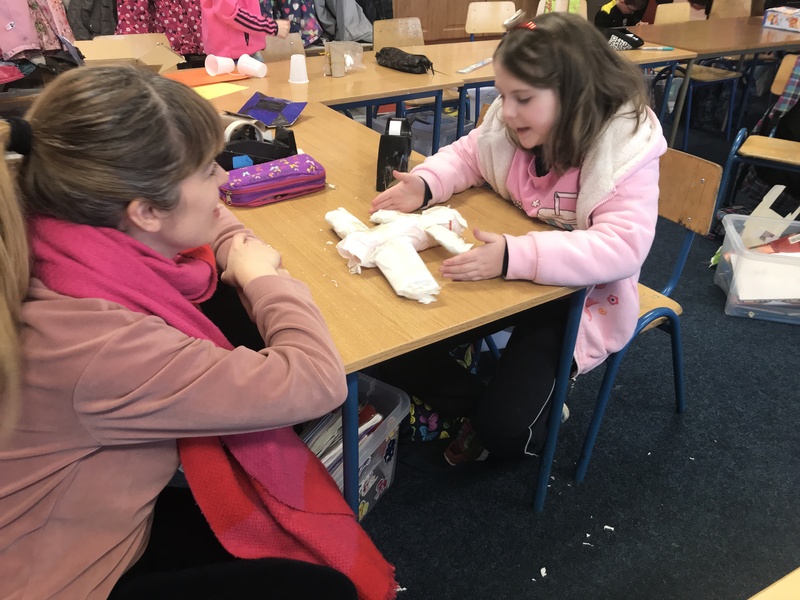 The Green School Committee visited the classes leading up to the launch to explain it to them. 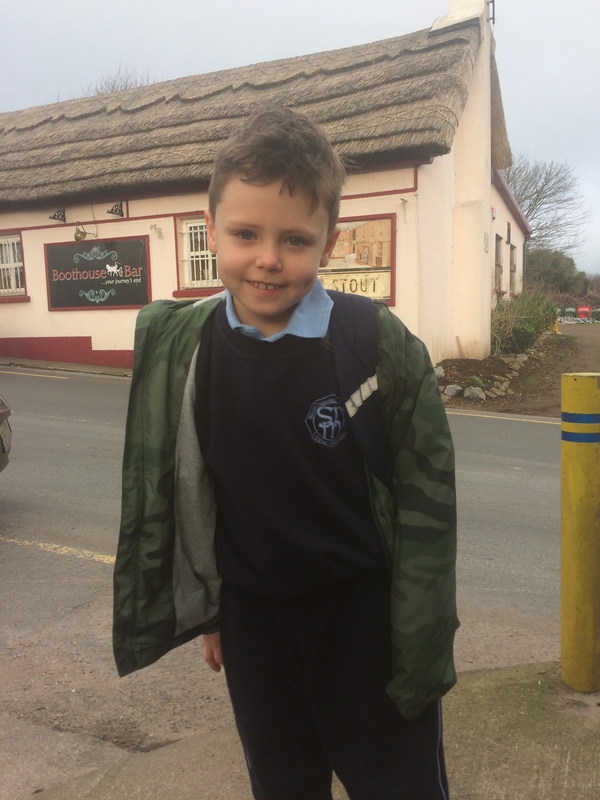 Notes were sent out to parents along with a message on the website. 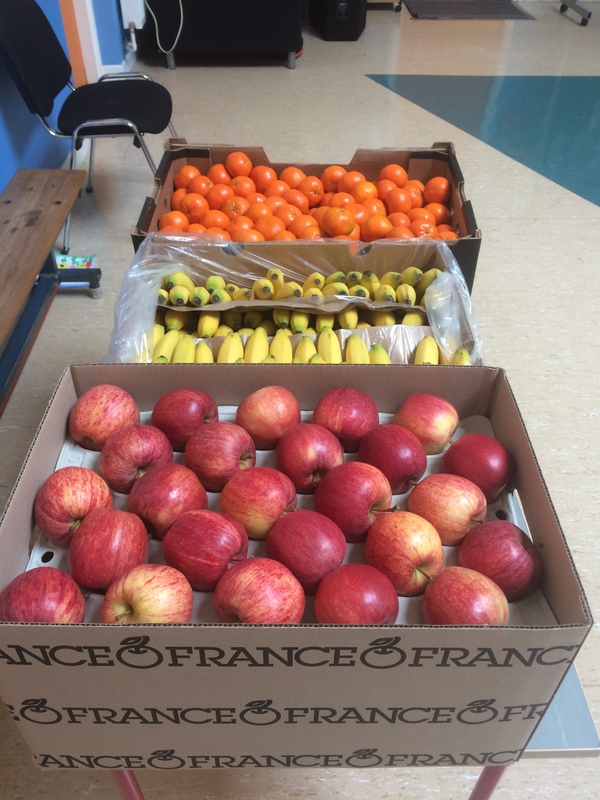 Keelings Fruit very generously sponsored us by giving us lots of fruit for all the participants. 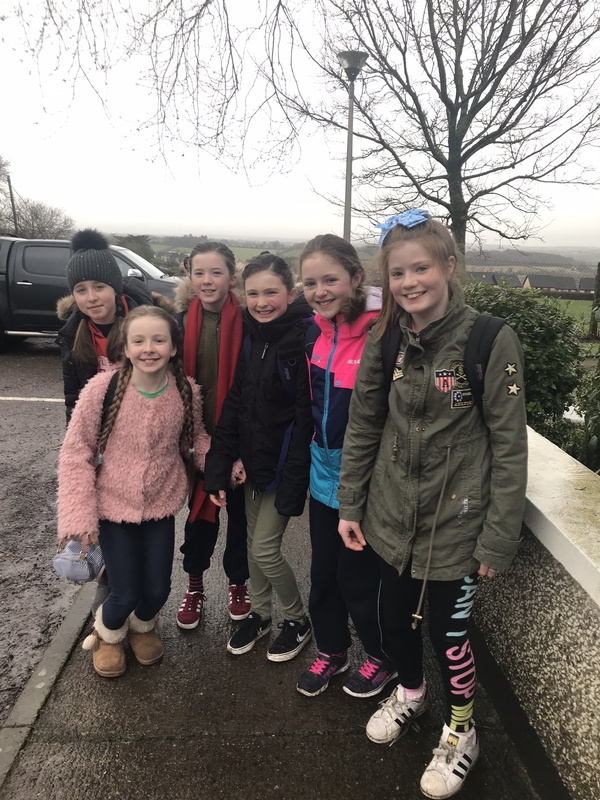 We were delighted to see the sun shining on the morning of the 15th. 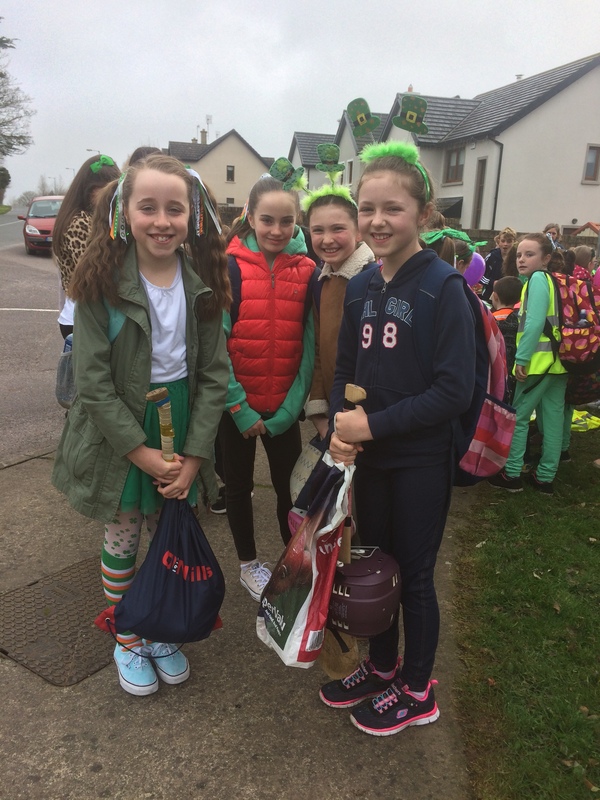 We all wore green to add to the festive atmosphere and Ellen Murphy, our Travel Officer, was there with a banner and balloons. 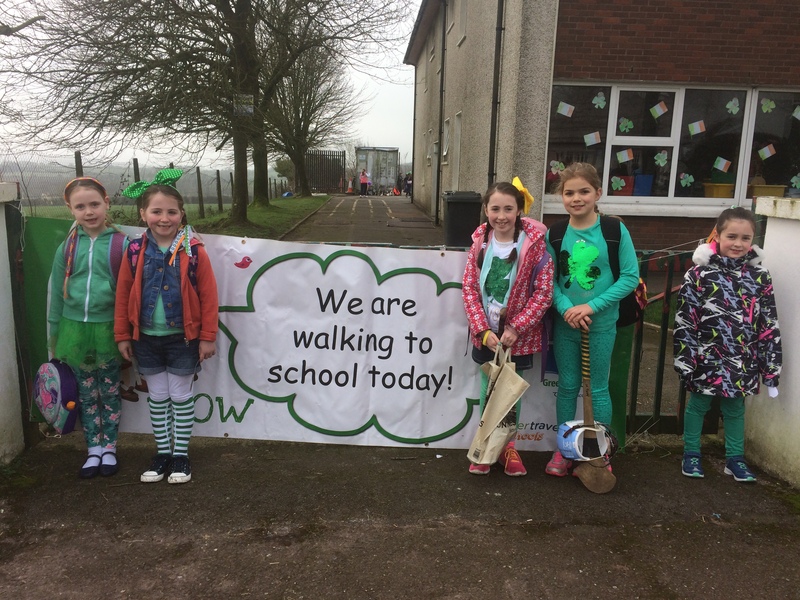 The walk was a big success and we hope that the whole school community will make an effort to continue this for the rest of the year, especially on Wednesdays. 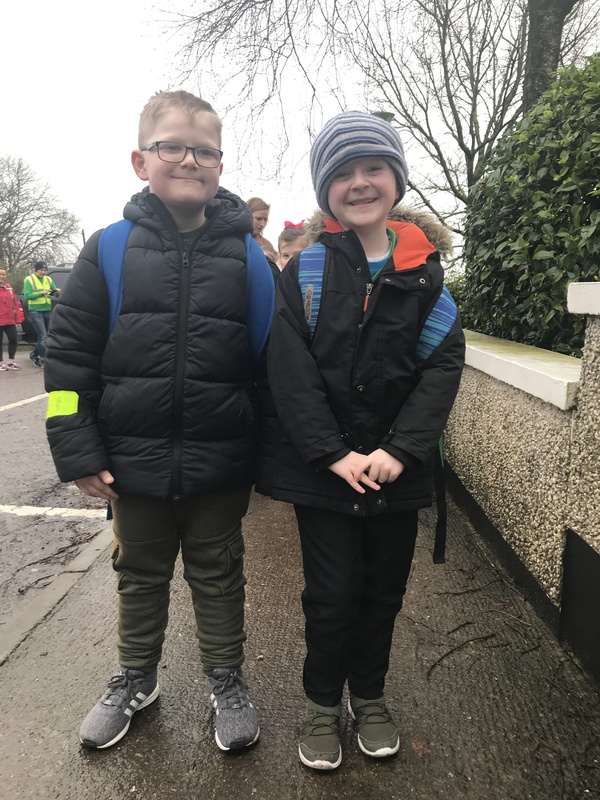 We have completed our February Walking Challenge and the results are in. 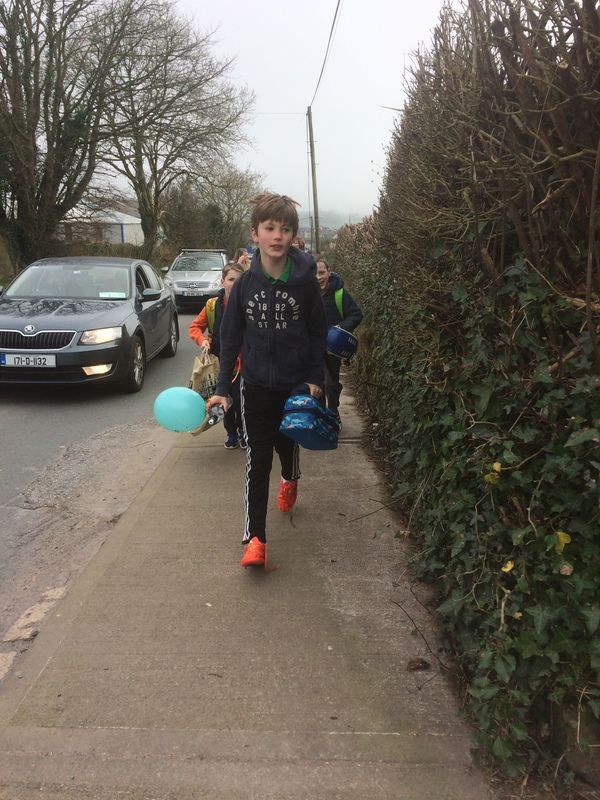 Before our 10 day effort, 48 children in our school walked to school on a typical day. 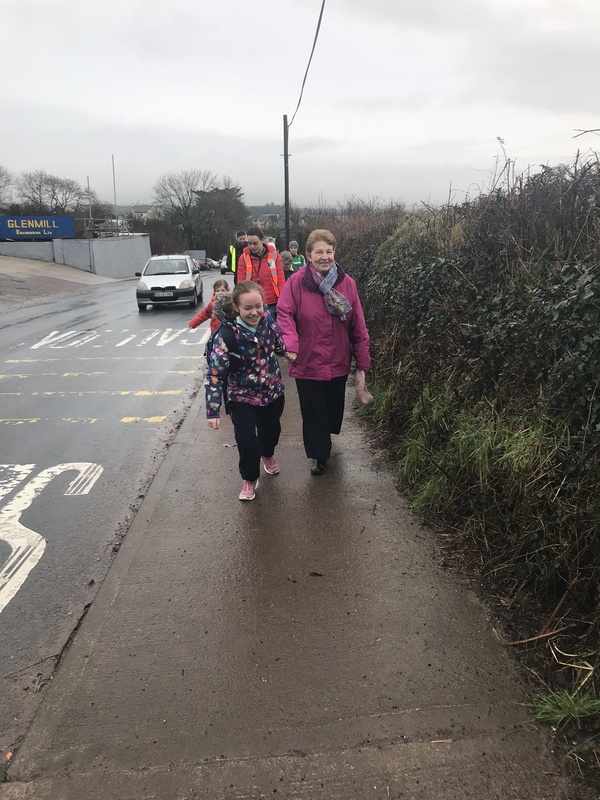 On Day 1 of the challenge, we had 104 walkers. 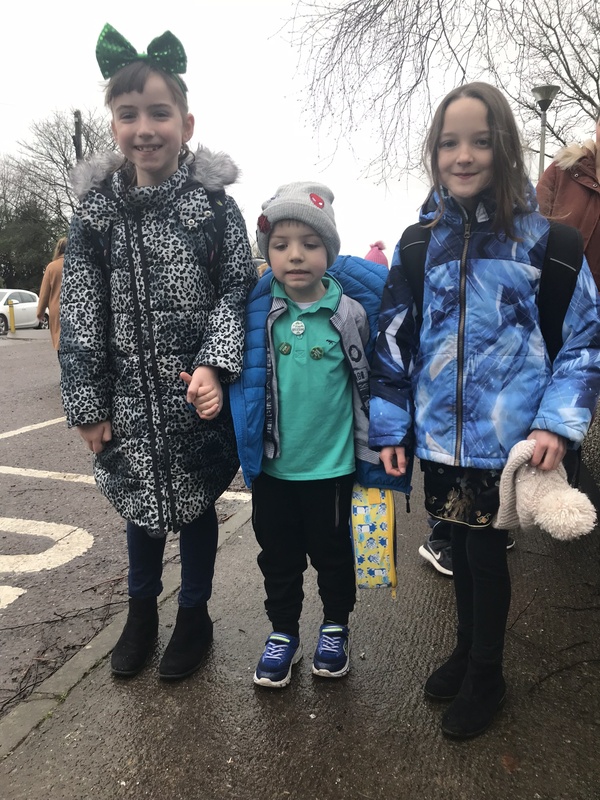 On Day 2, 106 children walked to school. Day 10 saw 106 children walking again. 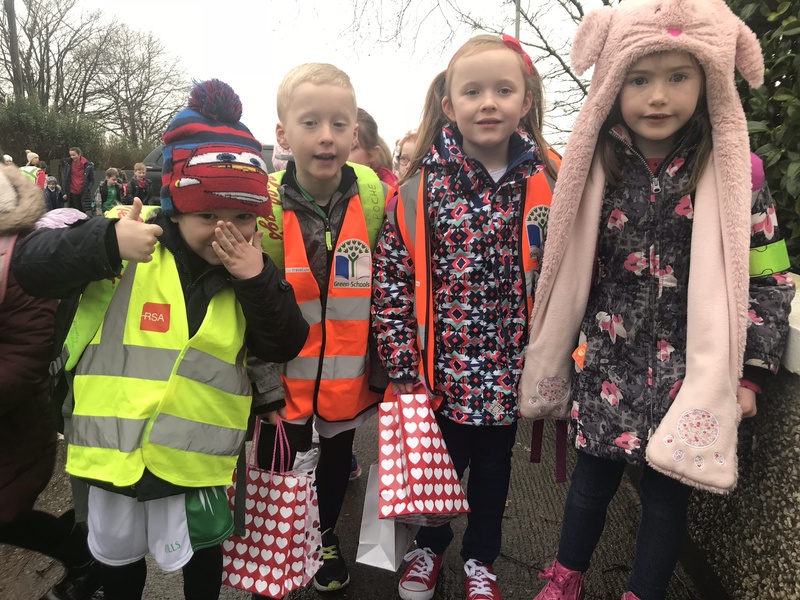 There were also a lot of younger brothers and sisters and parents spotted on the route to school so well done to all involved. 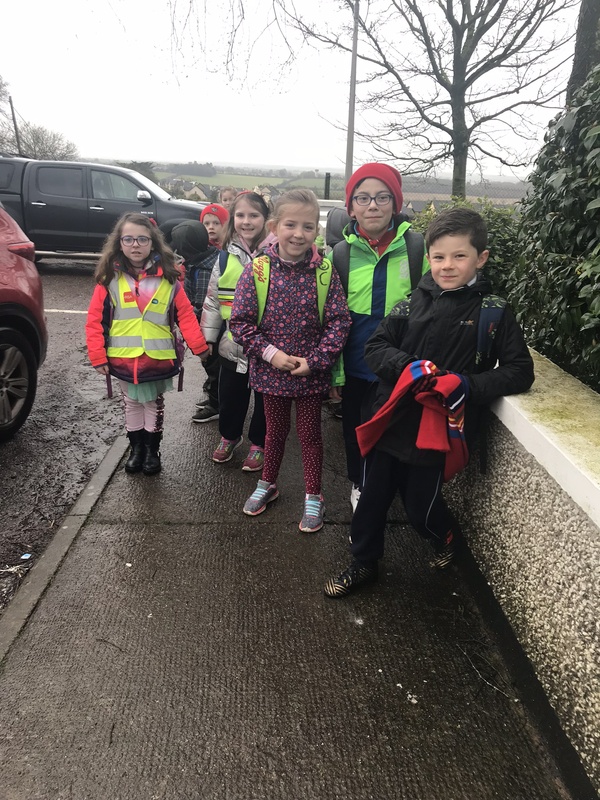 On all three survey days, Ms. O’Mahony’s first class had the highest number of walkers so well done to them. They have been awarded the golden shoes. 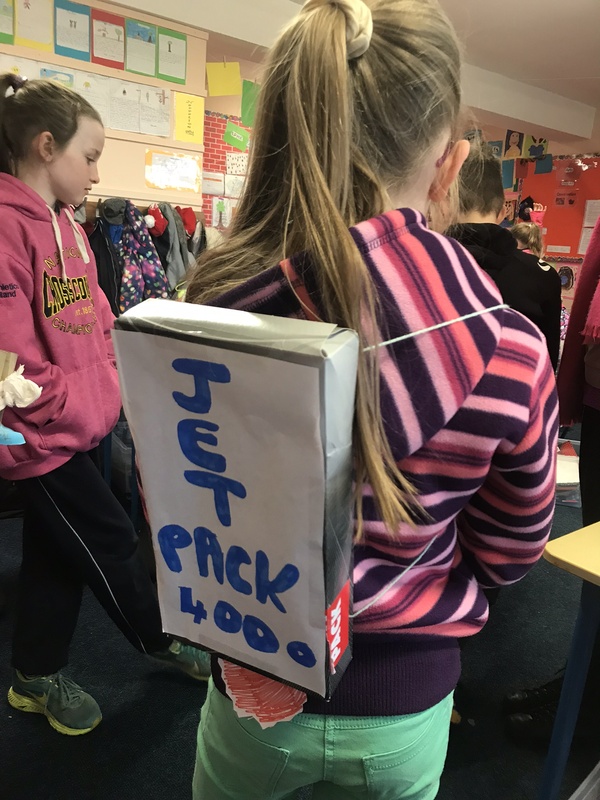 We will now submit our information to the Green-Schools Travel Competition 2017 and will update you all when we hear back from them. 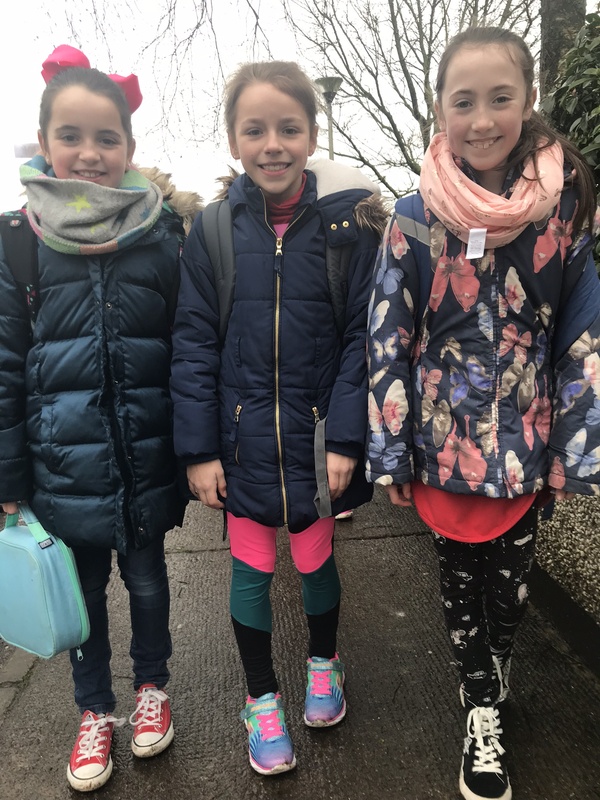 8/2/’17: Today was Day 1 of our February Walking Challenge and despite the cold weather we had lots of walkers and ‘park and striders’ this morning. 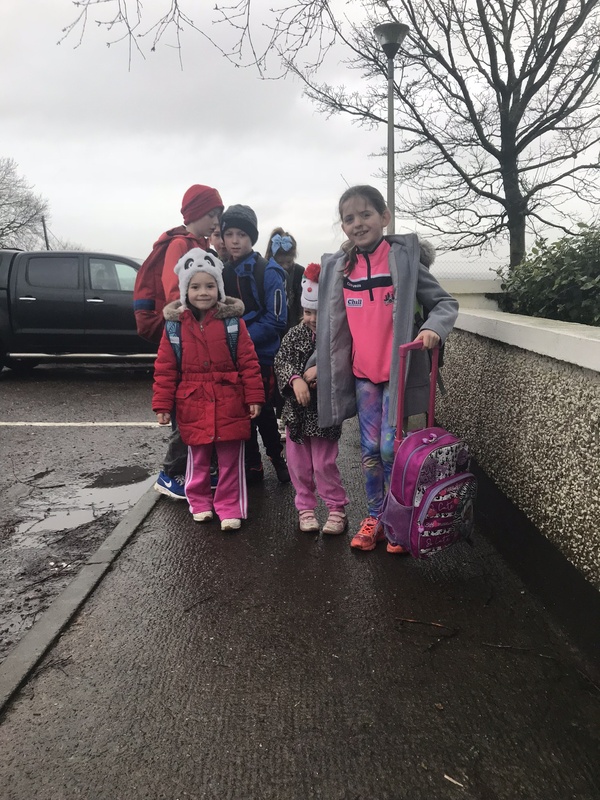 Lots of children walked from Ros Ard and others encouraged their parents to park at Ros Ard or outside the playschool and walk from there. 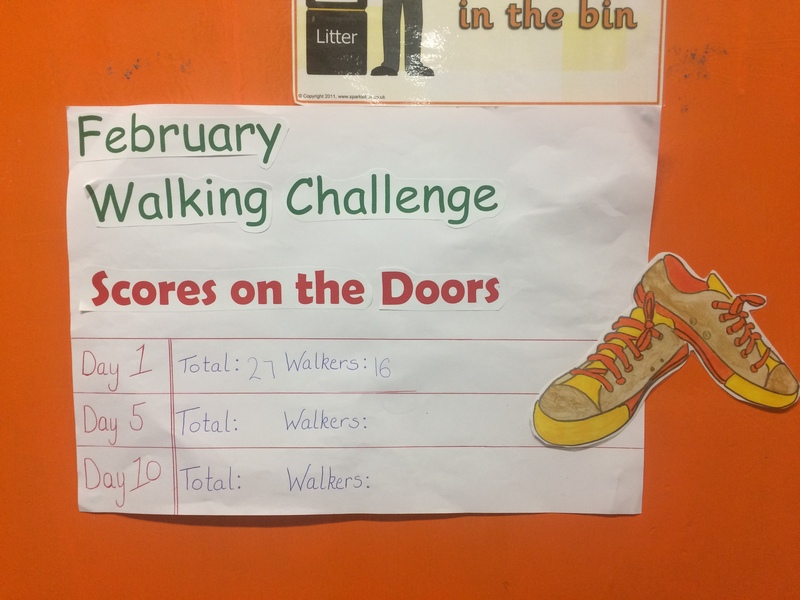 Our Green Team surveyed all of the classes today and gave each walker a pedometer so that they can count their steps during the challenge. 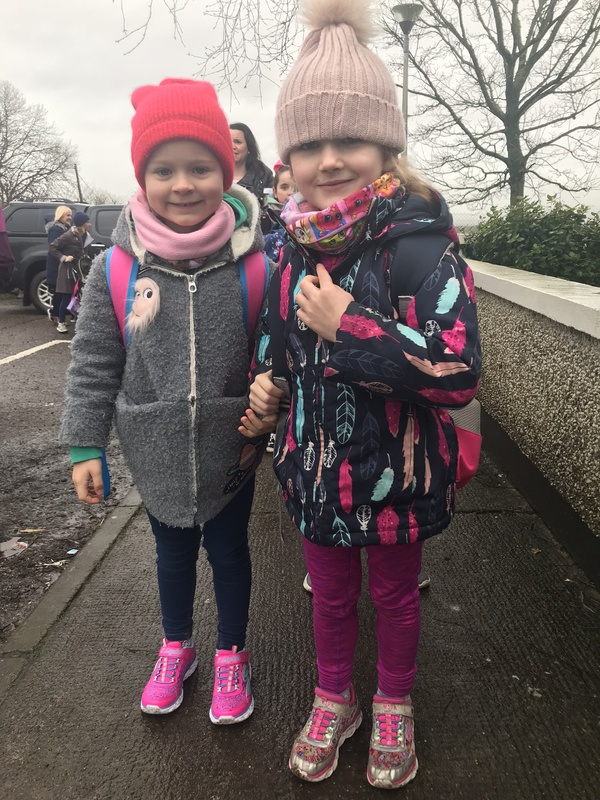 Ms. O’Mahony’s First Class were awarded the Golden Shoes for having the most walkers today. Well done First Class! On September 29th, 2016, our Green School Committee along with School Travel Officer, Ellen Murphy undertook a walkability audit around our school. Their findings and recommendations are now available to view in the report below. 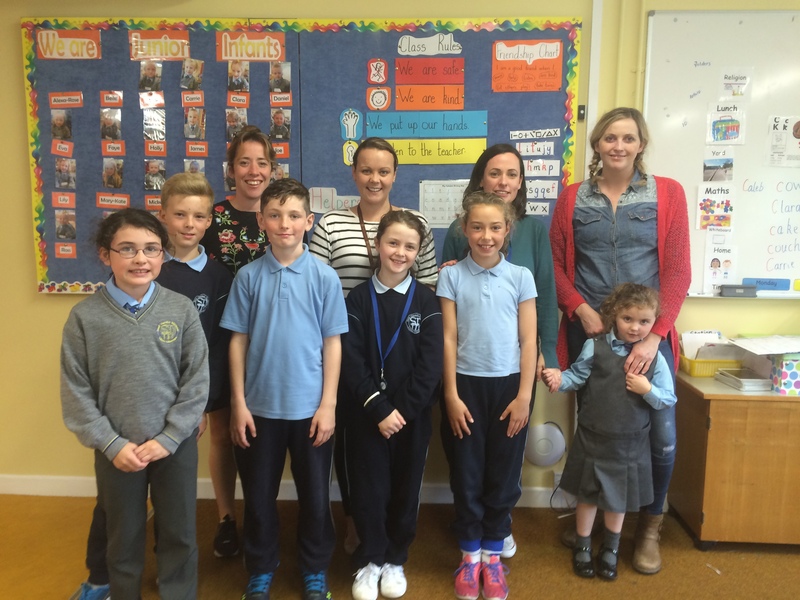 Our new Green School Committee is now up and running. 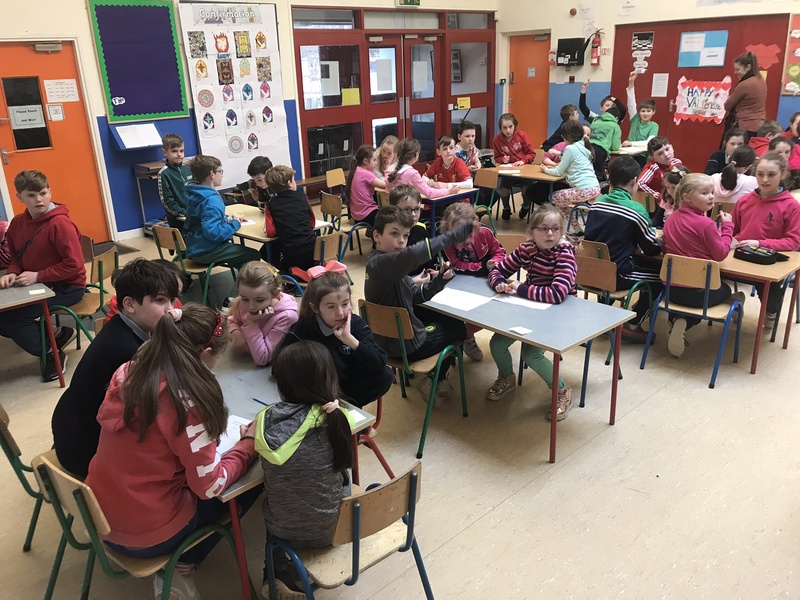 Lots of children were interested in being on our committee and there will be plenty of ways to get involved in the coming two years for those who were not chosen this time. Our Green Team undertook a Walkability Audit on September 29th. 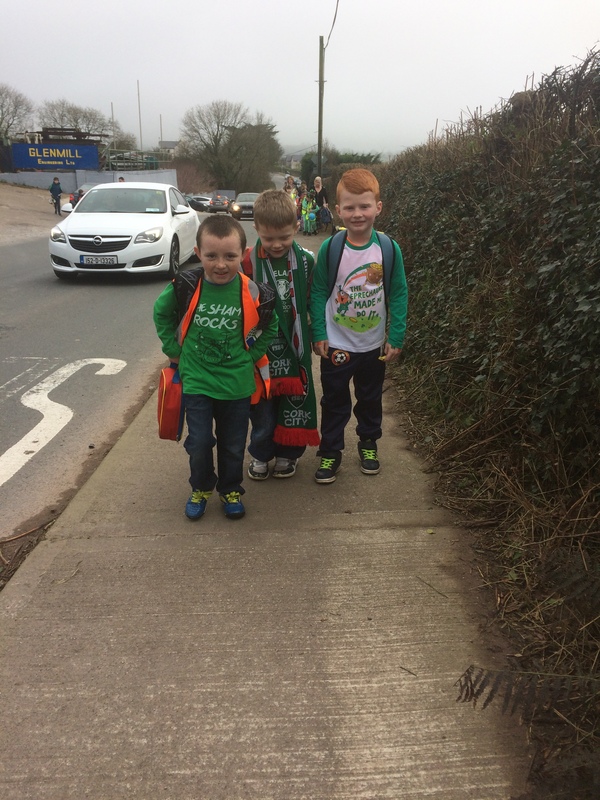 They were accompanied by Ellen Murphy (School Travel Officer) and Pat O’Callaghan (school caretaker). 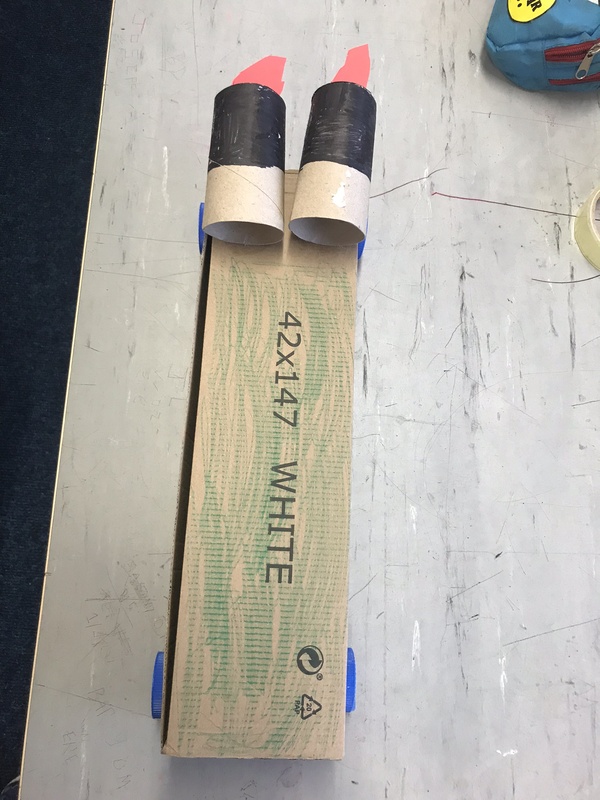 The results of this audit will be posted in due course. 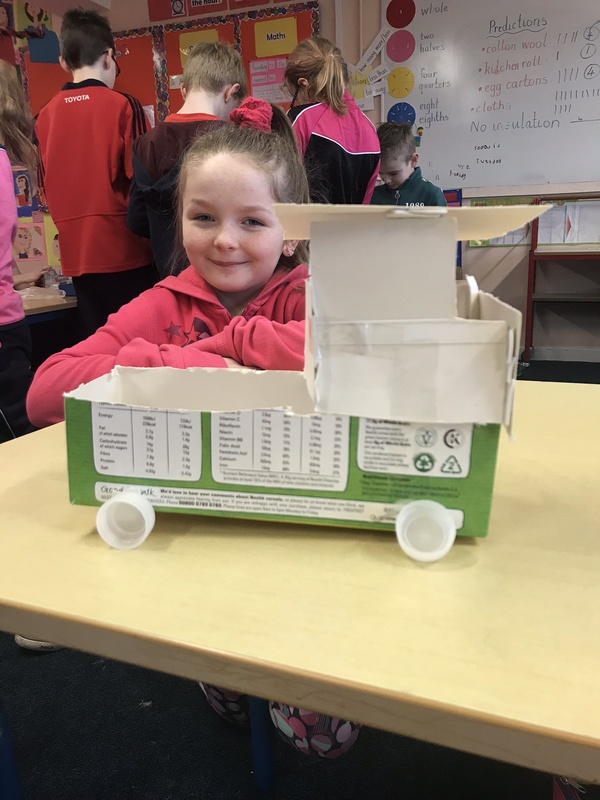 Green-Schools is an international environmental education programme, environmental management system and award scheme that promotes and acknowledges long-term, whole school action for the environment. 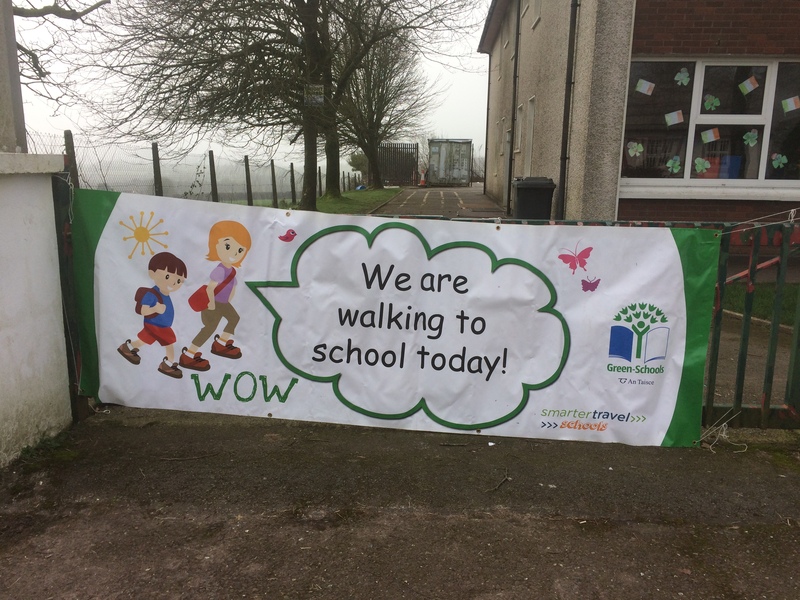 Here at Scoil Naomh Micheál, we have been involved in this initiative for a number of years. 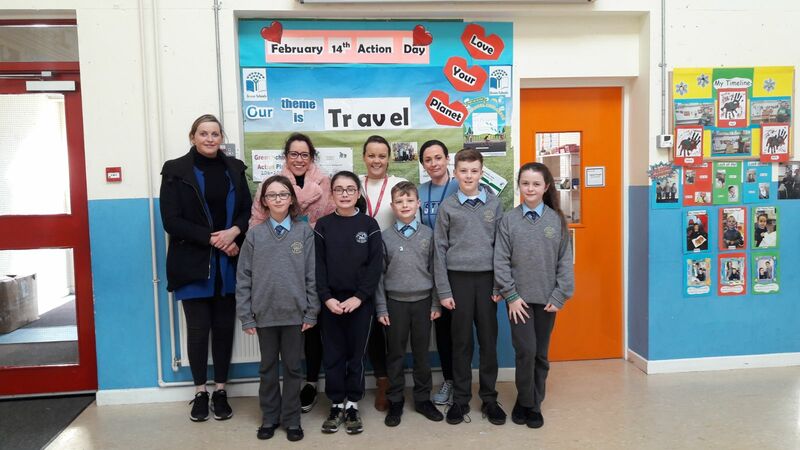 We are currently in the process of selecting a new Green School Committee to help us achieve a Green Flag for the theme of Travel. 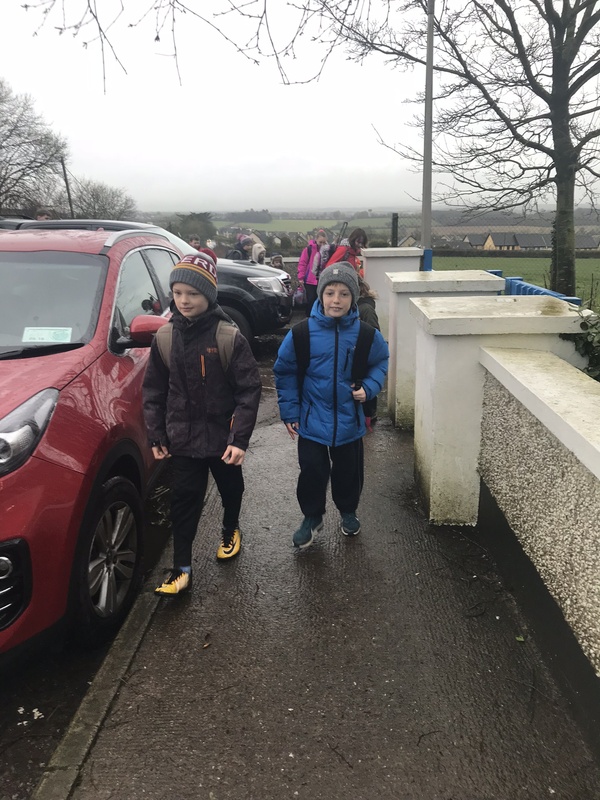 Over the next two years we will be trying to increase the number of pupils walking, cycling, “park ‘n’ striding”, carpooling or using the school bus, which will ease congestion by reducing the number of private cars arriving at the school gates. This will also lessen the overall impact on the environment, by reducing emissions and pollution. If you would like to be involved in this initiative by being part of our committee, or there is any other way that you could help, please send us a note to let us know and we will contact you. We will have 4-5 meetings during the year which will take place during school hours.